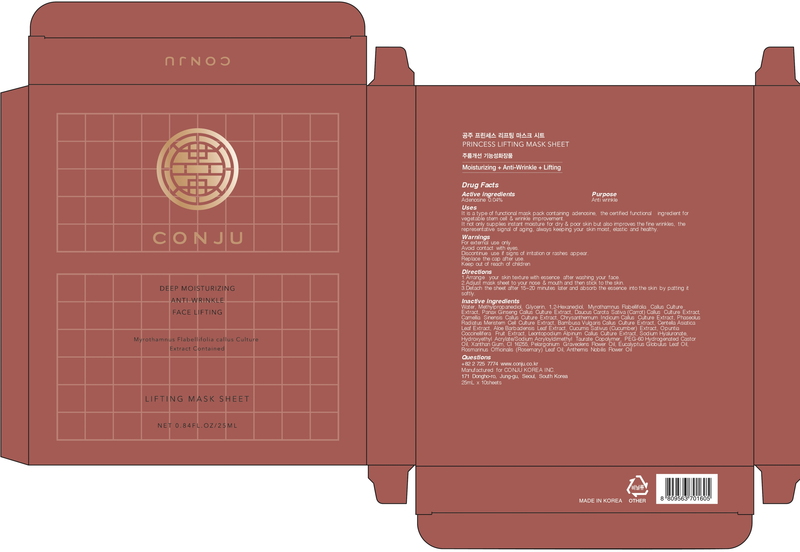 Proprietary Name: Congju Princess Lifting Mask Sheet What is the Proprietary Name? Congju Princess Lifting Mask Sheet with NDC 72950-040 is a a human over the counter drug product labeled by Conju Korea Inc.. The generic name of Congju Princess Lifting Mask Sheet is adenosine. The product's dosage form is patch and is administered via topical form. Uses:It is a type of functional mask pack containing adenosine, the certified functional ingredient for vegetable stem cell & wrinkle improvement.It not only supplies instant moisture for dry & poor skin but also improves the fine wrinkles, the representative signal of aging, always keeping your skin moist, elastic and healthy. Directions:1. Arrange your skin texture with essence after washing your face.2. Adjust mask sheet to your nose & mouth and then stick to the skin.3. Detach the sheet after 15~20 minutes later and absorb the essence into the skin by patting it softly.